235 years ago this week, a nearly unknown battle in the War of Independence—a battle the Americans actually lost—helped alter the strategic situation in the South, setting the stage for the Patriots’ eventual victory in South Carolina. The Battle of Hobkirk’s Hill, also known as the Second Battle of Camden, pitted Patriots against Loyalists and British regulars in a fight that epitomized American tenacity in the face of defeat. The story of this battle is recounted in a new bestselling book, Washington’s Immortals, which chronicles the efforts of the elite troops of the Maryland Line, some of whom played a key role at Hobkirk’s Hill. This unique book is the first Band of Brothers treatment of the American Revolution, capturing the most important elements of nearly every significant battle of the Revolution. Events began to unfold on April 24, 1781 at the British outpost in Camden, South Carolina. Renowned for being the ugliest officer in the British Army, Lord Francis Rawdon (pictured, left) led the British forces at Camden which consisted primarily of Loyalists. The twenty-six-year-old Rawdon commanded a network of fortified posts—Camden being the lynchpin —that stretched across the state, critical to the British strategy of controlling South Carolina. 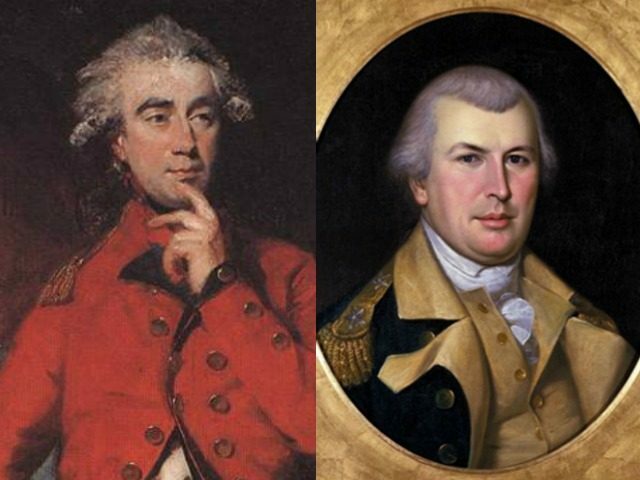 Opposing him was Nathanael Greene (pictured, right), arguably George Washington’s most able general, who led a larger force that included the Maryland Line, other Continental troops, and a sizable number of militia. Following the Battle of Guilford Courthouse, Greene marched his army into South Carolina. The outpost at Camden was well-fortified; therefore, Greene declined attacking it directly, hoping instead to draw Rawdon out of his defenses with a series of raids. Around April 24, Rawdon listened intently as a deserter, a Maryland drummer, divulged priceless information. The teenager, who had fought only hours earlier alongside his brothers in a raid near the outpost, revealed Greene’s order of battle to Rawdon. Additionally, the young man provided crucial information that Thomas Sumter and Francis Marion, both of whom led bands of militia terrorizing British forces throughout South Carolina, would soon be reinforcing Greene’s army. To make matters worse, Rawdon had recently received word of the fall of Fort Watson, another key link in the British supply chain traversing South Carolina. The loss of the outpost, in conjunction with Sumter and Marion’s forces running amok in the countryside and ambushing his supply train, cut Camden off from the British stronghold at Charleston. Rawdon needed to act quickly before exhausting his food and supplies. If Camden fell into American hands, several of the posts within the network would either wither on the vine from lack of supply or face destruction if Greene concentrated his forces on any one of them. Just less than two miles away from Rawdon’s approaching onslaught, Greene sipped a cup of tea while his fifteen-hundred-man army leisurely washed their clothes and cleaned their weapons. The Marylanders and the rest of Greene’s troops manned defensive positions outside Camden on a sandy ridge known as Hobkirk’s Hill. Timber and thick, lush underbrush coated large portions of the knoll, while a road bisected the center of the embankment. The general posted the Marylanders up front to the east of the road with the Virginia Continentals on its western side. The militiamen stayed atop the hill in reserve with William Washington’s cavalry. Greene’s army waited for Lord Rawdon to make the next move, completely unaware of how soon it would materialize. Taking advantage of the wooded terrain and swamps to mask their movements, Rawdon and his men approached within three hundred yards of the Americans before being seen. The Volunteers of Ireland, a unit of Loyalist Irish formed by Rawdon, charged the Patriot pickets. Hearing the sharp firefight in their front, Captain William Beatty of the Maryland Line, a veteran since 1776, and the other officers roused the men from their camp duties and ordered them to fall into the line. The Patriots soon brought their artillery to bear; the combination of cannon and musket fire checked Rawdon’s advance. Seizing the initiative, Greene ordered a counterattack. Everything seemed to be coming together for a crushing American victory, and then it all started to fall apart. As the Marylanders led a bayonet charge into Rawdon’s advancing troops, a musket ball struck Beatty in the head, killing him instantly. The death of a prominent, much-admired battle captain, viewed by many as bulletproof, caused “confusion and [the men] dropped out of line.” The disorder spread through the companies around Beatty as more men fell. Lieutenant Colonel Benjamin Ford, an original Baltimore Independent Cadet in the Maryland Line, was struck with a ball in the arm, a wound that eventually proved fatal. Fatefully, in the chaos, the commanding officer of the 1st Maryland ordered the regiment to fall back and re-form, creating a disastrous chain reaction. As the men retreated, a hole formed in the American line, dooming the American counterattack. Their stand kept the cannons out of British hands, but Smith himself was captured. Rawdon initially condemned him to death on the accusation that Smith had killed a British officer in cold blood weeks earlier at the Battle of Guilford Courthouse. When he discovered the inculpation after the battle, Greene sent Rawdon a letter and vigorously defended Smith’s honor and laid out the facts. Persuaded by Greene’s letter, Rawdon rescinded Smith’s death sentence and paroled the wealthy Baltimore native. With the guns safe, Greene continued his general withdrawal, retreating several miles to the old Camden battlefield. Here, amid the bones of the fallen and debris of the previous summer’s battle, he prepared to receive Rawdon, whose exhausted troops had the strength to pursue the Americans only a few miles.